If laughter is the best medicine then there’s the best treatment on offer at Create Theatre. A trio of television’s top comics will be delivering comedy to audiences on Wednesday (26 March) in conjunction with Nottingham Comedy Festival. 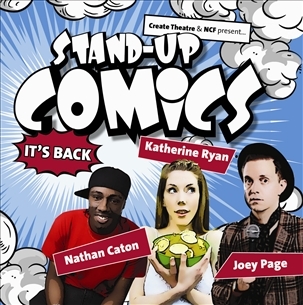 Comedians Nathan Caton, Katherine Ryan and Joey Page bring their one-liners and observational humour straight from televisions shows such as 8 out of 10 Cats, Never Mind The Buzzcocks and Mock The Week. The show will be MCd by stand-up comedian Tony Jameson who has a wealth of gig experience at some of the UK’s top comedy shows as well as performing at the Edinburgh Fringe Festival. There will also be a mystery guest at the show described only as ‘an up and coming local act’. Theatre co-ordinator Adam Pownall said: “Our stand-up comic nights are always a great success and I for one can’t wait to see this – our fourth line up of top comedians. Our mystery act is also one to come along and support. Tickets for the 7.30pm performance cost £15 each and the show is recommended for people aged 16 and above.